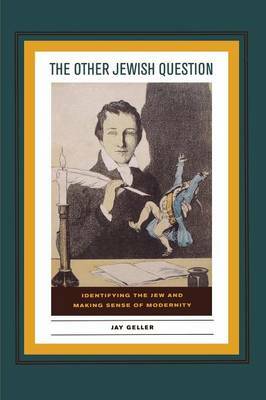 This book examines how modernizing German-speaking cultures, undergoing their own processes of identification, responded to the narcissistic threat posed by the continued persistence of Judentum (Judaism, Jewry, Jewishness) by representing "the Jew"'s body-or rather parts of that body and the techniques performed upon them. Such fetish-producing practices reveal the question of German-identified modernity to be inseparable from the Jewish Question. But Jewish-identified individuals, immersed in the phantasmagoria of such figurations-in the gutter and garret salon, medical treatise and dirty joke, tabloid caricature and literary depiction, church facade and bric-a-brac souvenir-had their own question, another Jewish Question. They also had other answers, for these physiognomic fragments not only identified "the Jew" but also became for some Jewish-identified individuals the building blocks for working through their particular situations and relaying their diverse responses. The Other Jewish Question maps the dissemination of and interrelationships among these corporeal signifiers in Germanophone cultures between the Enlightenment and the Shoah. Its analyses of ascribed Jewish physiognomy include tracing the gendered trajectory of the reception of Benedict Spinoza's correlation of Jewish persistence, anti-Semitism, and circumcision; the role of Zopf ("braid") in mediating German Gentile-Jewish relations; the skin(ny) on the association of Jews and syphilis in Arthur Dinter's antisemitic bestseller Sin against the Blood and Adolf Hitler's Mein Kampf; as well as the role of Jewish corporeality in the works of such Jewish-identified authors as Rahel Levin Varnhagen, Heinrich Heine, Karl Marx, Max Nordau, Franz Kafka, and Walter Benjamin, as well as such "Jew"-identifying writers as Ludwig Feuerbach and Daniel Paul Schreber. The Other Jewish Question portrays how Jewish-identified individuals moved beyond introjection and disavowal to appropriate and transform this epidemic of signification to make sense of their worlds and our modernity.